menus articles et collectionne des disques. Un jour, elle a la chance d’interpréter à la radio une chanson qui devient un succès national. A partir de ce moment, les concerts se succèdent. Passionnée par sa carrière, elle refuse tout lien sentimental et recherche désespérément ses origines. Elle apprendra son histoire de façon tragique. 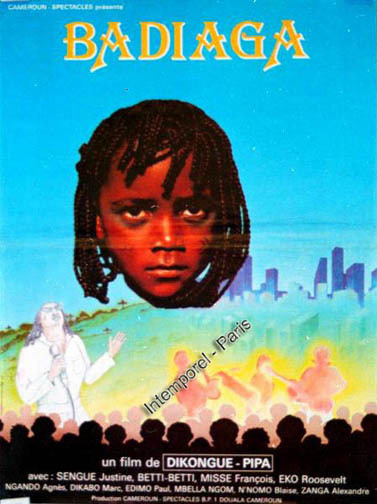 Ce film est inspiré par la vie de Beti-Beti, légendaire chanteuse camerounaise. Droits: Monde, sauf pour distribution sur le continent africain. Badiaga follows the rules of a classical tragedy. A three year old girl is abandoned on a food market and is sheltered and raised by a deaf and dumb vagrant. They develop a very strong bond. Badiaga daydreams about becoming a famous singer, and listens in total fascination to the artists who sing in the different cafes where she wanders. One day she has the chance of singing on the radio a song which becomes a national hit. From that moment onwards, she holds a nonstop succession of concerts. In love with her career, she refuses any romantic relations and searches desperately for her origins. This story was inspired by the life of Beti-Beti, a legendary Cameroon singer. Availability: The World, except the African Continent.